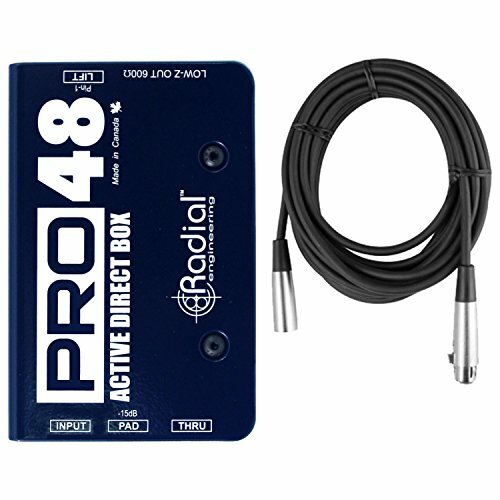 The Radial Pro48 is a compact high-performance 48V phantom powered active direct box designed specifically for todays high output instruments. The Pro48's innovative internal switching power supply significantly increases headroom producing less distortion while yielding a smooth, linear response that extends from 20Hz to well above 40kHz. This results in natural, uncolored signal that is as good or better than DI boxes costing several times more. The superior performance makes the Pro48 an ideal candidate for use with battery powered active basses and acoustic guitars that tend to overload other direct boxes. The compact Pro48 is built road-ready with 14 gauge steel throughout. A unique book-end design creates a protective zones around the switches and connectors while the internal I-beam construction assures outside stress will not torque the PC board and deteriorate solder connections. A full bottom no-slip pads adds mechanical isolation and electrical insulation to further extend the Pro48's lifespan.